In the winter I always crave citrus. Fortunately, we get a lot of oranges from our organics to you delivery (if you’re in the Portland area, look them up- organicstoyou.org). We love this delivery because we get a box of random organic fruits and veggies, sometimes things we’ve never heard of or cooked with (kiwi berries and celery root). We are challenged to create our meals around this box and it has been a lot of fun, mostly for me since hubby cooks and I eat most of the creations. Yum! This time it was my turn to use a basket ingredient (Chopped style) to come up with something new. I chose the orange and worked my thumbs in an allrecipes.com search. 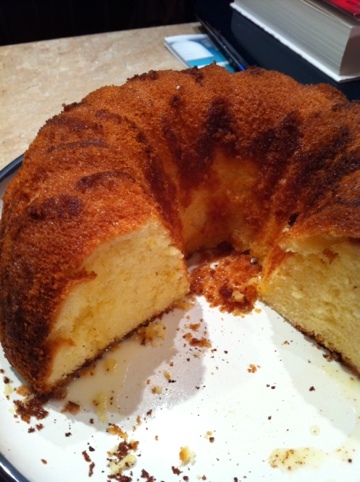 My choice was an orange chiffon cake, which I’d never eaten let alone made. I’ve included the recipe with my tweaks as usual. This time there are lots I would change for next time but the taste was so amazing I’ll have plenty of opportunity to perfect the recipe. Preheat oven to 325. You’ll need a 10 inch tube pan (I used a bundt pan and it worked fine) ready. Sift the flour, sugar, baking powder and salt into a large bowl and make a well in the center. In another bowl, beat egg yolks until thick and lemon colored. Beat in the orange juice (3/4 cup if you don’t use water) oil, water (if you use it), vanilla, and orange and lemon peels. Pour into the well you made in the dry ingredients and beat with a wooden spoon until smooth. In yet another bowl beat egg whites on medium speed until foamy. Add cream of tartar and beat until stiff peaks form. Gradually fold the whites in to the batter. Pour batter in your tube pan and bake for about 55 minutes or until cake springs back lightly when touched. Mine was overdone at 55 minutes. I should have checked it at 45 or 50 but got distracted, which I’m sure will not happen to any of you, right? As soon as the cake is out, turn it upside down on to the platter you plan to serve it on. 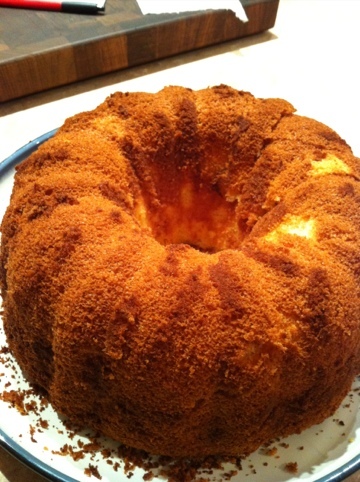 Cool the cake completely, loosen it from the pan and drizzle your glaze over top. Now, eat!!! Later I added a simple glaze: 1/4 cup powdered sugar mixed with 1/8 cup orange juice. After the glaze was on the cake it was a lot moister! Categories: Baking, Delectable Dabbling, Food, Sweets | Tags: all natural, baking, Cake, orange | Permalink.